Continuation of color and prints. The 1920s is favored with dropped waist evening dresses and lots o’ beads. The tuxedo is a big look updated with wide-leg pants. Pencil skirts are still hot but with a new twist – draped. White and more white in lace, eyelet, and sheer fabrics. I always enjoy Ralph Lauren for his classic American designs. He continues to find inspiration in the 1920s. Sheer fabric dresses and skirts in subtle pastels. Floral scarves, cloche hats, lacy cardis and three-piece suits. Super palazzo pants paired with super platform shoes. Beaded gowns for evening in white and silver. Both day and evening wear are fabulously elegant but without the fuss. Marc Jacobs is all about layers, fringe and movement for spring. Cropped jackets with fringe at the hems paired with sheath dresses embellished with silicone fringe. (Reminds me a bit of Paco Rabanne, who in the 1960s designed a line of clothing using materials such as metal and plastic.) The fringe and iridescent fabrics sway and shine with every movement for a dramatic effect. Sixties style coats – short with sleeves to the elbow – are the signature silhouette. Smart bowling bags and gym totes in fun shades of green and gold. Jacobs wasn’t the only designer to show thin socks with pumps. This is a look that repeats itself season after season, but has yet to translate onto the streets. 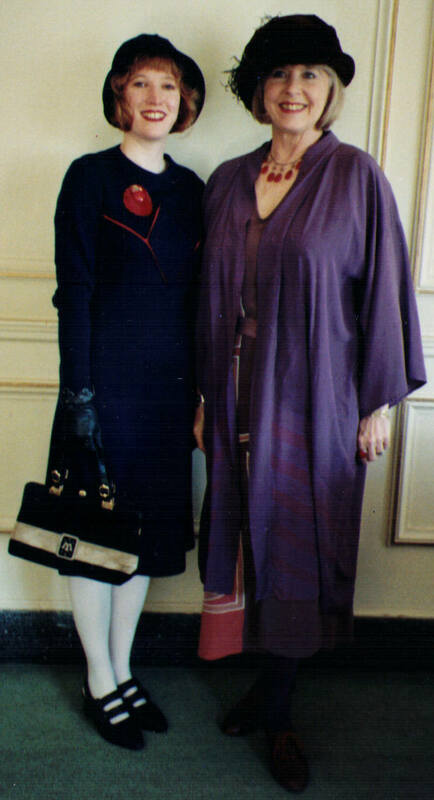 The other night while watching the television premiere of Pam Am, I thought about my mother’s big trip to Europe in 1964. Unlike today, traveling then was a rare treat and something to appreciate. If you traveled, you did so in style. Mom carried custom-made luggage by Hartmann with her monogram, of course. She sported a black dress suit from Saks Fifth Avenue paired with black pumps (can you imagine?). Accessories included a racy fedora-style hat and black gloves. On board she brought only her cosmetic case and a small handbag. Once she arrived, not to worry, there were porters everywhere to help with the luggage and taxicabs were not prohibitively expensive. How lovely that must have been. Pam Am takes us on a journey back to those days when flying was glamorous. Set in 1963, the series follows four young women who have chosen (for the time being) the less traveled road of work rather than marriage. 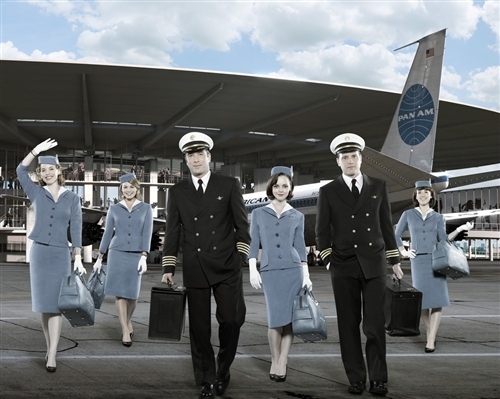 But being an airline stewardess, especially a Pan Am stewardess, was not just any job. According to former Pam Am stewardesses interviewed for the show’s website, they were treated like movie stars. The airline provided limos, upscale hotels, and plenty of time off. They also insisted on girdles and weight check-ins. Break any of the uniform rules and risk getting grounded. What caught my eye as far as fashions was the ladies’ uniform, which includes a matching jaunty hat with white piping and the Pam Am flight pin. And … white gloves. Gloves for style have been trying to make a comeback for at least six years. Every fall we see gloves featured in magazines, but not on the street. If this series catches on, gloves just might enjoy a revival. The uniform itself is a well-tailored suit. I love the powder blue color and short nipped waist jacket. The skirt hem is straight and ladylike below the knee, just what we’re seeing today. Can’t go wrong with a smooth fitting short sleeve white Oxford shirt. Nice detailing includes a back belt and BTW, the shirt remains untucked. The whole ensemble is simple yet chic. Another attention getter is the iconic Pam Am flight bag. They all have one and it’s good-looking. I kind of suspect it’s more stylish than the original, but in any case I predict we will soon see the silhouette coming and going. There’s something very appealing about the consistency of everyone dressed stylishly the same. In addition to the principal characters, costumer Ane Crabtree dressed the extras, most of whom were passengers. Ane chose for the ladies high collar coats, fur stoles, and hats. To my eye they were kind of matronly looking, creating a nice contrast to our adventurous heroines. Image courtesy of Bésame Cosmetics. When I was in high school, I was wild about makeup and red lipstick in particular. My fave was called Brick Red by Halston. (Yes, I spent quite a few babysitting bucks on my lips.) Dark and dramatic, with Halston I thought I was the cat’s meow. Since red is the lipstick color for fall I’m revisiting my passion for the color with lipsticks from Bésame Cosmetics Inc. I was thrilled to find Bésame available through Vintage Blue Moon at the recent Vintage Fashion Expo. The Bésame line offers six shades of vintage inspired red lipsticks all in high-pigment, semi-matte formula. Bésame Cosmetics Inc was launched in 2004 by Gabriela Hernandez and her husband Fergus Hernandez. (The name Bésame comes from an old song – Bésame Mucho, which means kiss me lots.) Originally from Buenos Aires, Gabriela immigrated to the US when she was 12 years old. Her life has always been about art, having studied fine art and worked in photography and graphic design. Working also as a make-up artist and a cosmetics historian instilled in Gabriela a desire to create a new line that offers women classic glamour of the 1940s. I spent quite a long time standing at the Bésame display pondering my options. The shades run from Carmine, a light orange-red to Cherry, a bright true red to Merlot, which is a brown red. All the lipsticks are made in America of natural ingredients including aloe, ginseng, avocado oil and vitamins A, E, and C. Bésame products are not tested on animals. Looking for a shade I could were daily, I settled on Red Velvet. A rich medium red, it’s flattering on my fair complexion without being too bright. All the colors come in a lovely gold tube container and the best thing? The lipstick itself is in the 1940s style bullet shape, making application precise. In fact, with the bullet shape a lady can get perfect cupid bow lips. The color is rich enough that I can dab it on as a stain and top it with gloss for a lighter look. For the full vintage red effect it applies evenly with one swipe, two swipes for drama but it does take a steady hand and a mirror. Where it goes, it stays – just ask my beau. Kudos also to Bésame for the packaging. Attached to each tube is a nicely designed card depicting a vintage model wearing that particular lip color. On the back of the card is listed all the red colors with descriptions. The only downside is the semi-hard plastic wrapping, which I hope can be recycled. I’m having fun this fall with my new Bésame Red Velvet lipstick and I look forward to trying their other products. Oh, and congratulations to Gabriela on the publication of her new book: Classic Beauty: The History of Makeup, Schiffer Publishing. It’s due out on September 28, 2011. Me and my beau at Gatsby Summer Afternoon 2011. This year I was honored to serve as a picnic site judge for the Gatsby Summer Afternoon. Wow! What a job and what fun. 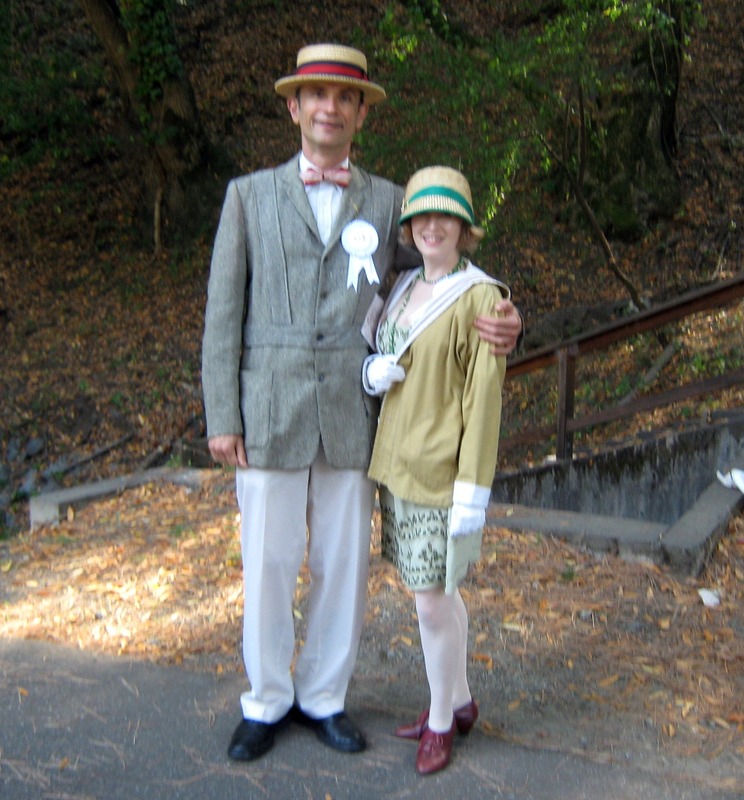 On Sunday, September 11th over 700 dames and dappers showed up at the Dunsmuir Hellman Historic Estate in Oakland. Dressed in their swankiest 20s-40s summer duds, the crowd carted an array of period accoutrements and set up beautiful picnic sites. I’ve been to the Gatsby Summer Afternoon before and I have put together my own picnic site, plus I have reported on the event for the San Francisco Chronicle. I know what to look for. Authenticity is important, appropriate themes to the era, creativity, and charm are all key ingredients. Little things like having the right ground cover, adding fresh flowers, and using family plates and silverware can make a difference. The right food and food containers are important (a Whole Foods box eliminated one contender). Attention to detail is essential. Two prizes are awarded – one for a grand site with 5 or more people and another for a small site with 2-4 people. For the grand site award we chose a picnic with a home-made pavilion. The group used low tables with vintage tablecloths and decorated their site with lots of garden flowers and period pieces such as a Victrola and a croquet set. What we liked about this site was it truly looked like the 20s. It was real, creative, and charming. The small picnic award went to a couple who have been attending the Gatsby Summer Afternoon for years. They covered a 30s fold-up wood table with a lace tablecloth, 1930s glass place settings and get this – wood fruit baskets also from the 30s. Vintage chairs are always hard to find, but they had them. Decorations included an old red cooler, paper parasol, and vintage picnic baskets, one of which had Bakelite plates. A bouquet of pink roses placed on the table and a small American flag to honor the day were just the right extra touches. A rug would have made this site even better. Turns out these event regulars knew that but, they brought the wrong one and decided to go without. Smart move, because throwing just anything on the ground could be a bust. I saw a lot of that and it ruined some otherwise good looks. Everything counts. The most interesting lesson I learned was that having people in the scene makes a difference. People sitting in their site completed the aura and made it pop with energy. No matter how attractive a site might have been, if it was empty it lost its vibrancy. Now, what was I wearing? I went with a 20s-style sheath dress paired with cream stockings and burgundy Oxford shoes. A straw cloche hat and long beads topped the look. It was a sunny but breezy day and that posed a challenge. Since the dress was at the knee I needed a longer coat, but what I had wasn’t appropriate for the season. There was a lot of riffling through the closet that morning. My jackets were either too modern or too warm. Finally I came upon something recently given to me, a vintage short sailor coat. As it turns out, everything came from my own collection. The Gatsby Summer Afternoon 2011 passed too quickly but was, as always, a lovely day. Time to plan for next year. Click here to see photos of the winning picnic sites. Sara is sporting the Pan-Am Coat by Trina Turk. Photo courtesy of FlairWalk. Fall fashions are in full swing so let’s check in with Sara, Chief Style Officer of the popular online boutique – FlairWalk. What’s hot for fall 2011? Coats. “Coats have been really strong this season with use of colors and different patterns and textures of fabric,” says Sara. francis is showing bright colors like red and yellow. Beth Bowley is going for a little ooh la la with a Jacquard black lace coat while also offering a classic tweed style. Trina Turk is going retro with her jet setting Pam-Am coat. According to Sara, many of these coats are stand alone pieces that are not just about warmth but also add a lot of pizzaz to any outfit. Sara from FlairWalk rocks this 60s-inspired dress by francis. Photo courtesy of FlairWalk. Dresses are big this season with 60s motifs such as block colors and elbow length sleeves. Trina Turk, francis, and Corey Lynn Calter are all showing 60s-inspired dresses. Handbags are still a seasonal must-buy. Just like in the 60s, women are now changing their handbags to coordinate with their outfits. Popular lines are Desigual and Desigual Lacroix. 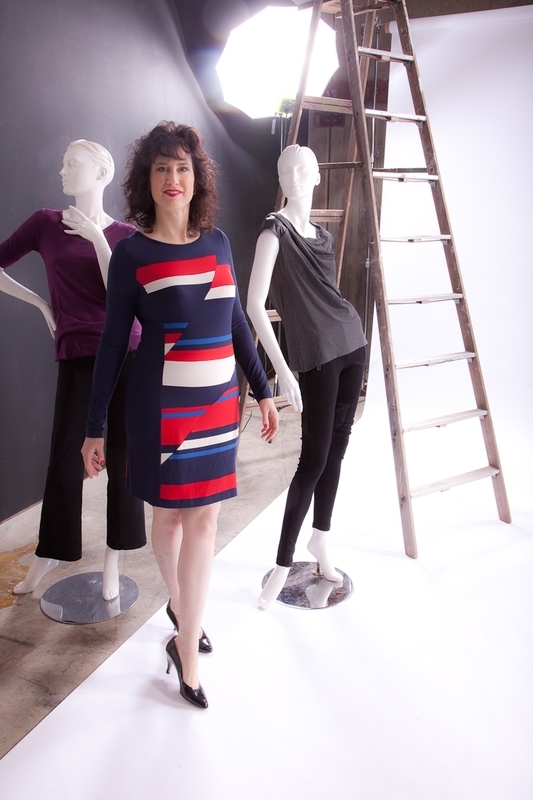 A new designer for FlairWalk this fall is Yoana Baraschi. Sara is excited by the cosmopolitan feel to this line. “The Yoana Baraschi look is very New York to me,” explains Sara. The slim silhouettes and simple lines say easy city-chic. Thanks, Sara, for a taste of fall 2011. To see the designers Sara mentions visit FlairWalk. Once there you will also find Sara’s style tips, FlairWalk videos, and so much more fashion fun. Step into Mom’s Closet for another personal style story – Mother Daughter Deco Style. Did I say a tote bag a week? Never should have said that … kiss of death. So, it’s been longer than a week, but I still have bags to talk about and this next one is special. The lovely one pictured here was made just for me by my sister-in-law, Lori. Using vintage fabric Lori created the pattern and went to some trouble to get it just right. I sport it when I’m off to Pete’s for some reading catch-up and a latte treat. 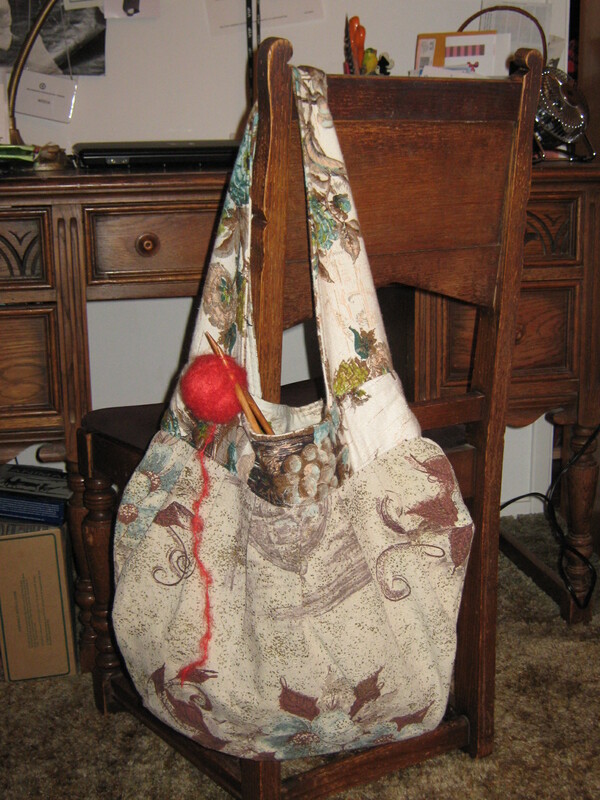 It’s handy oval shape easily carts around my latest knitting project, latest WWD, mags, and novel. It’s roomy and to me looks like something a suffragist would have carried at the turn of the 19th century (toting her subversive pamphlets, of course). Use vintage fabric and really make it one-of-a-kind.